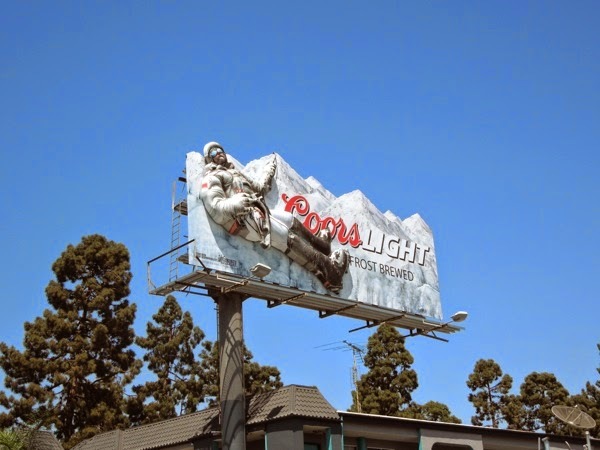 Daily Billboard isn't normally one to indulge in a drink at the very start of the working week, but in this case we'll make an exception for this fantastic Coors Light special 3D mountain climber installation, which redefines the term 'cool'. 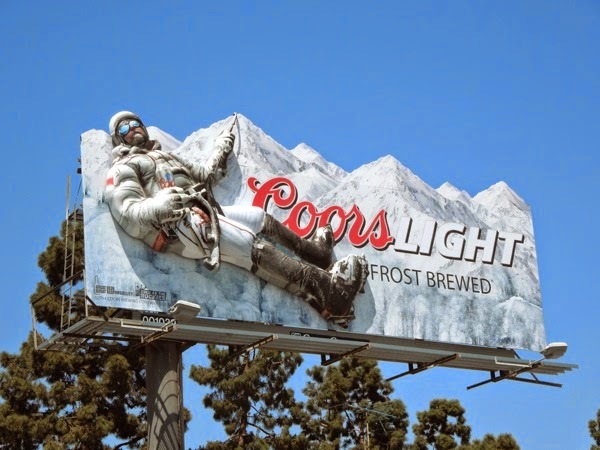 It looks like the light beer brand may have taken their 'Cold as the Rockies' slogan to heart with this adventurous mountaineer scaling those snowy peaks. 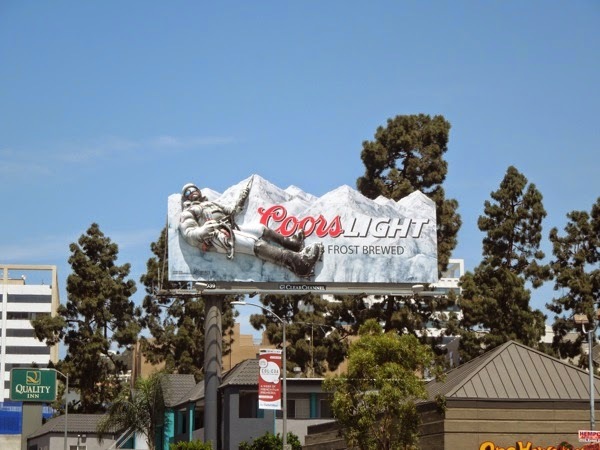 Daily Billboard loves the inventiveness of this beer billboard courtesy of The Integer Group out of Denver, with media buying at Kinetic Chicago, whilst the actual 3D relief mountain climber was created by our clever friends Atomic Props & Effects. 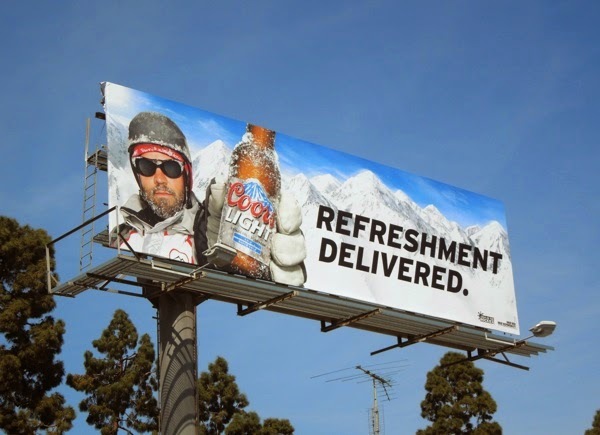 Here's also the previous Coors Light 'Refreshment delivered' billboard creative from the same ad location on April 3, and as you can see this new eye-catching embellishment continues the youthful, adventurous spirit and the drink's 'coolness' credentials. 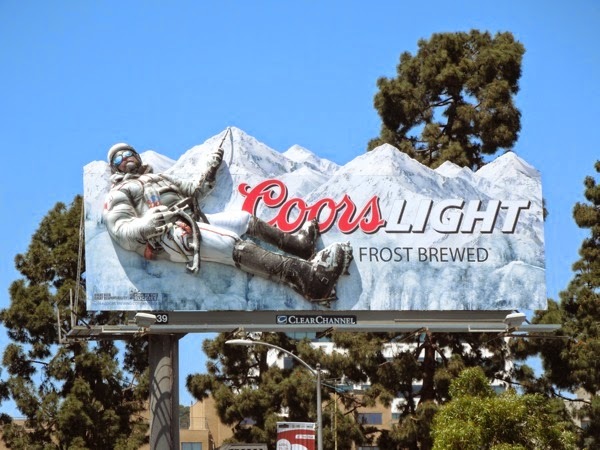 With temperatures in the 80s when this billboard was photographed along La Brea Avenue above Sunset Boulevard on April 30, 2014, this mountain climber would certainly need something ice cold to keep him refreshed (although drinking beer whilst climbing mountains at that altitude is probably not the safest thing to do in the world). 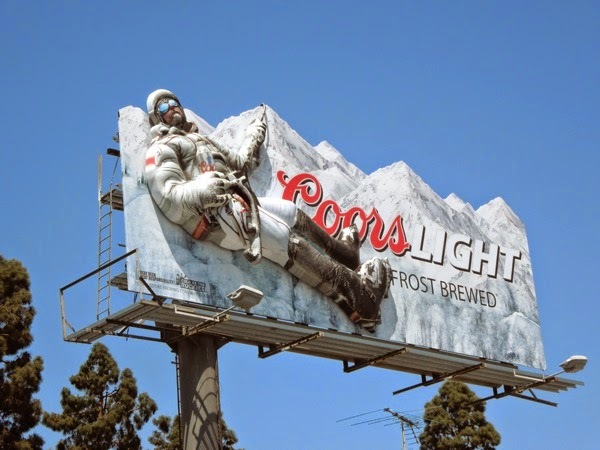 Creating a spectacle like this 3D billboard is definitely one way to capture the imagination of the beer drinking public, but here are a few other outdoor beer ad campaigns to illustrate how other beer brands try and grab your attention. 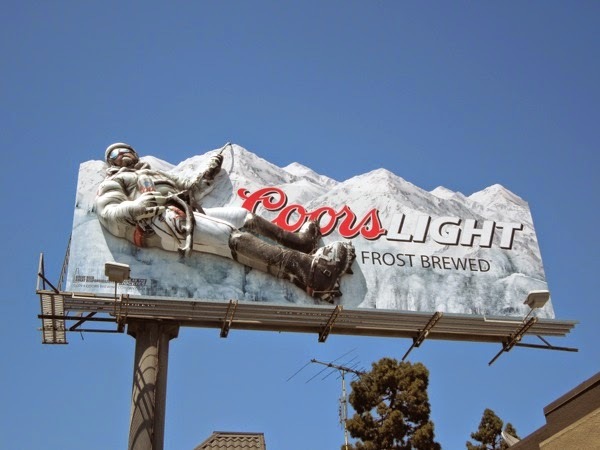 Cheers to you creative people and please keep this kind of advertising coming, as it certainly makes the skies of L.A. (and other cities) more interesting on a daily basis. 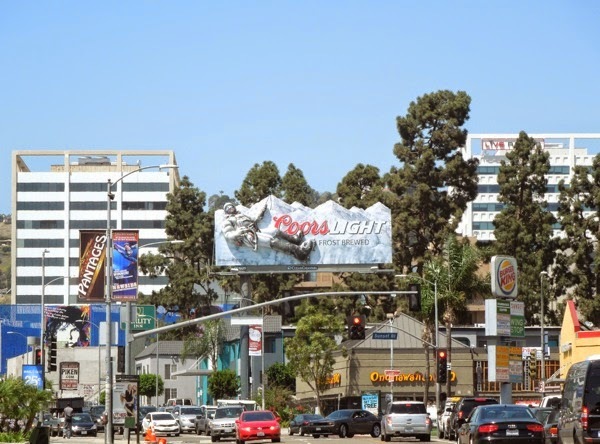 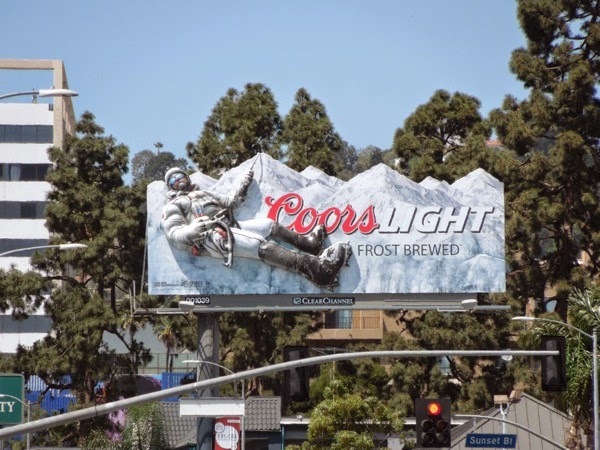 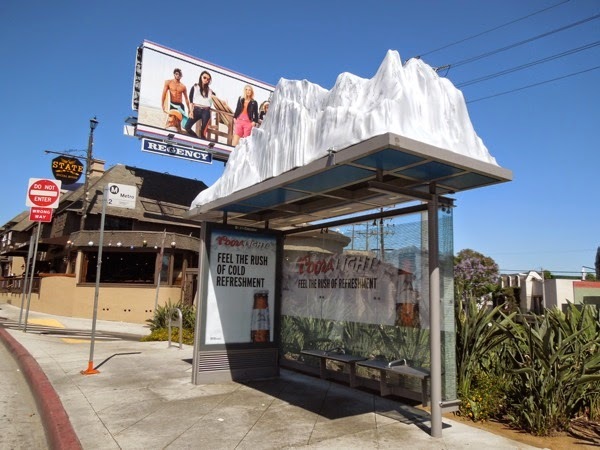 UPDATED: As a special bonus, check out these fantastic Coors Light snow-capped mountain peak installations along L.A.'s Sunset Strip which are a nice continuation of the out-of-home campaign. 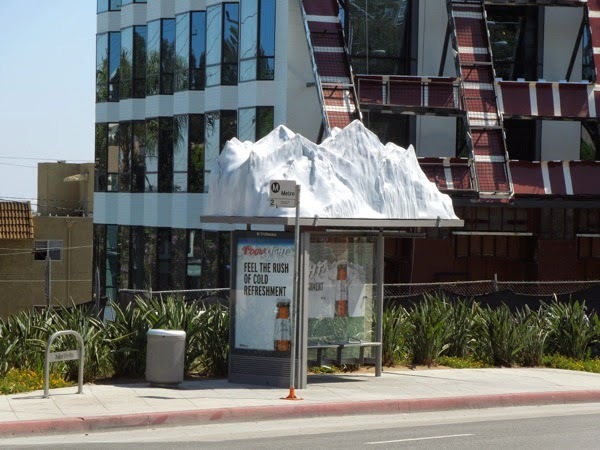 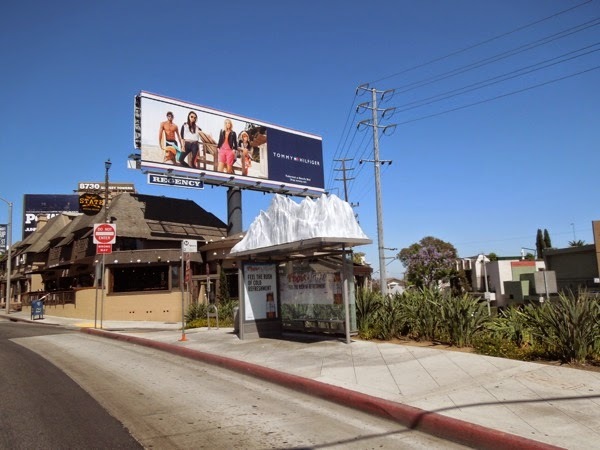 Installed on June 3, 2014 outside The Standard Hotel and at Holloway Drive and Sunset Boulevard in West Hollywood, apparently these are the first ever bus shelter builds in Los Angeles and they certainly stand out on a hot summer's day. 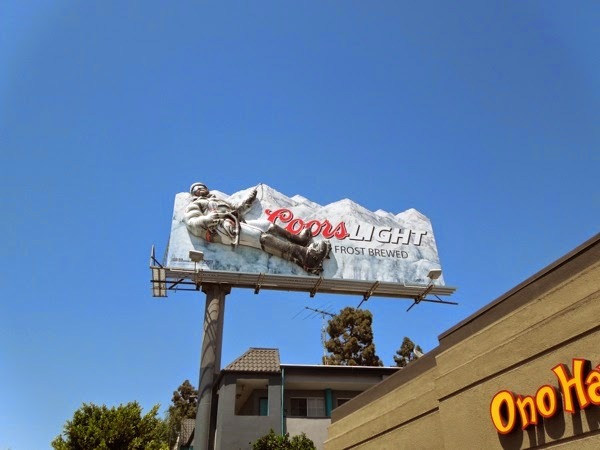 Kudos to all involved.